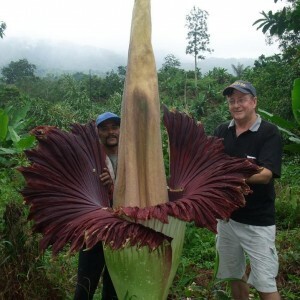 Biggest flower on the planet!! The flower arises from an underground tuber which can grow to 90kg!! It takes several years to get to flowering size. The flower gets to 3m tall & 1.5m wide!! The plant itself comes up & dies down each year & its thick green patterned stem can be 20cm through and usually 3-6 metres tall…it unfurls to a single leaf. A very unusual sight. The dormant period for it here in Nambour QLD is spring & this means the plant can be grown here. 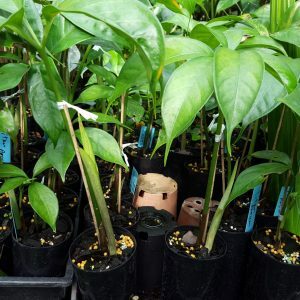 However in more cooler area, the plant may go dormant in winter or earlier. The true flower is inside the green spathe with amazing male & female flower parts. Full sun to part shade. 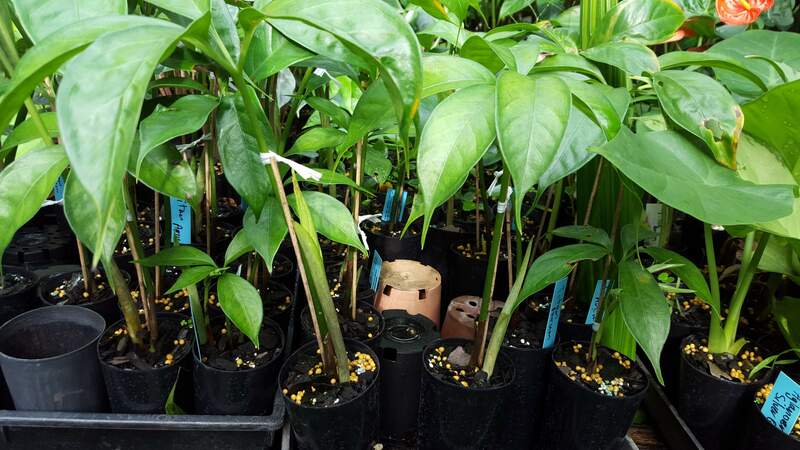 Amorphophallus titanum. 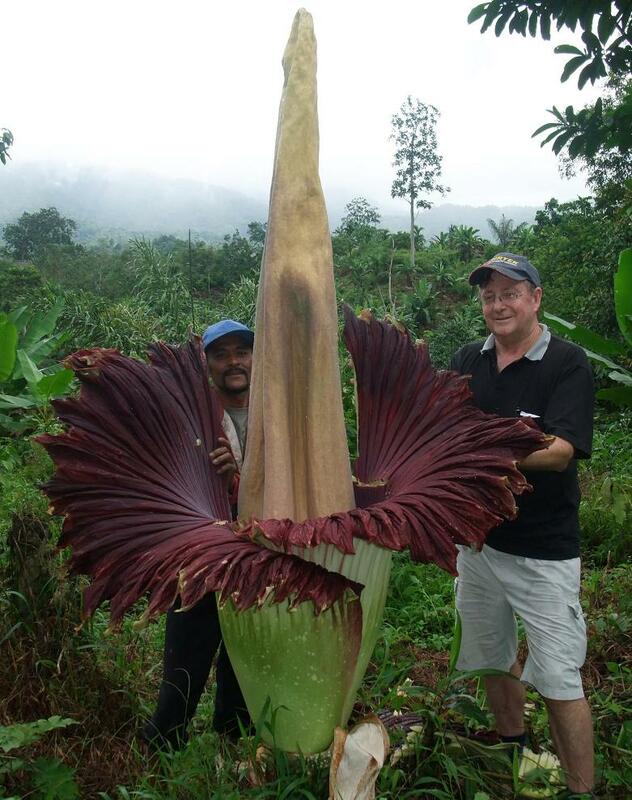 Biggest flower on the planet!! The flower arises from an underground tuber which can grow to 90kg!! It takes several years to get to flowering size. The flower gets to 3m tall & 1.5m wide!! The plant itself comes up & dies down each year & its thick green patterned stem can be 20cm through and usually 3-6metres tall…it unfurls to a single leaf. A very unusual sight. Its habitat is at 700m in Sumatra Indonesia & although not far from the Equator the temperatures do not usually exceed 30oC!! Even though there is not a cold season in this area the plant dies down back to the tuber each year when it feels like it.. for about 4 months. The dormant period for it here is winter & this means the plant can be grown here. The true flower is inside the green spathe with amazing male & female flower parts. They are pollinated by flies attracted by the smell of dead meat…the smell was about as strong as a dead mouse & that’s all!! The aim is to grow the tuber to flowering size. Do not over pot…just keep repotting & look after the plant well as soon as it reemerges in late spring. Get the plant into full sun to get maximum growth. 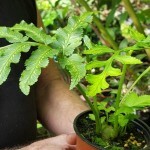 Use a very well drained potting mix & keep moist but drier in winter. It will probably will not rot but if you are trying in a cooler climate it would be best to keep under cover in winter. I would not just plant it in the garden & hope for the best as you will probably lose the plant over winter. These are the true flowers above in the green base of the plant. You can see the fly doing the pollination from male to female parts. NOT THE TRUE FLOWER!! The Giant Flower photoed at the top is not the true flower in botanical terms. But in the eyes of all but the botanist it is what is known as `the flower’. The same can be said of many of our best flowering plants. INTERESTING BUT TRUE…BUT WHO REALLY CARES FOR GENERAL PUBLIC INTEREST PURPOSES. August 2011. Bob in Sumatra. Here is a new plant just coming up with its new foliage unfurling. They grow to 6 metres!! 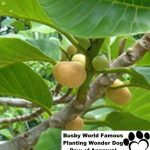 We found this plant flowering on a private tropical fruit plantation in Sumatra at 700m altitude not far from the Equator. The plant is found at this altitude & must be found ie. you have to wait for a report to come in to find one. Because of the altitude temperatures are not that hot hovering around 30oC all year. The plant has a natural 3-4 month dormancy before it reemerges each year.